Come to St. Paul FSC during your school break or during the summer for week long training camps. St. Paul FSC offers high performance and developmental figure skating programs, along with cutting edge training equipment, and a Regional, Sectional, National and International level coaching staff. Whether you are working on your Triple Lutz or your Single Lutz, St. Paul FSC has a training camp program for you. Camps offer a complete day of off ice and on ice technique classes, conditioning and dance classes, mental training class, freestyle sessions and optional private lessons. Campers will take the same classes and skate along side St. Paul FSC skaters, who include State, Regional, Sectional and National champions and competitors. Camp skaters are invited to participate in our weekly St. Paul FSC Competitors Exhibition to showcase your progress to your friends and family. JOin us for Training Camp for a week, a month, or the entire summer! Name your start date and your end date. We invite you to join us for one, two, three weeks (or more) any time during our summer training session. Indicate which weeks you would like to attend and we will customize a schedule just for you. Coaches, you are welcome to attend with your skater! Contact us to let us know you are attending and to request guest coaching privileges to coach your skater while at St. Paul FSC. Custom camps for one to ten skaters all through the year. We offer full time training year around and welcome skaters to come and train with us for development and elite level group classes and private lessons. Click on "Register for Training Camps" to register by the week or by the day. Each day (Monday - Friday) will include approximately 2.5 hours on ice and 1.5 hours off ice. Additional lessons or freestyle sessions may be added for additional training. Optional private lessons in Freestyle, Moves in the Field or Ice Dance from our Regional, Sectional, National and International level Coaching Staff. Optional Choreography lessons available. Have your program choreographed or add flair to an existing program at St. Paul FSC! At least one 30 min private lesson is recommended daily. Coordinate your camp experience with our testing sessions or Skate St. Paul competition! Come for the competition, stay the following week for camp! St. Paul FSC is proud to be just one of the first three training facilities in the United States offering the Electric Spinner. Originally designed in Russia and adapted for the United States by U.S. Figure Skating, the Electric Spinner is designed to give skaters the edge in learning superior rotational technique and conditioning for jumping and spinning (availability is limited). St. Paul FSC features three overhead harness systems (one off ice and two on ice). The off ice system specifically is used to train air position and rotational speed while the on ice systems are used to develop jumps more quickly and safely on ice. 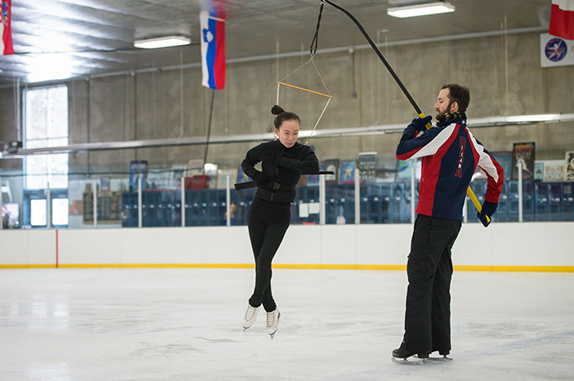 The Pole Harness allows the coach to track the skater on their own jump patterns on the ice and aid the axis and height of the jump. The pole harness gives the skater a more realistic experience than the overhead harness and allows them to jump more on their own while still having the safety benefit of being in a harness. Skating Director and international coach, Ann Edison is our resident Dartfish specialist. She is a USOC Certified Dartfish Video Analysis Technician, and will analyze your jump technique and measure your jump height with Dartfish. Dartfish lesson (availability is limited). St. Paul FSC offers elliptical machines, treadmills, stationary bikes, free weights, TRX training, and a dedicated workout/ballet/off ice training room. 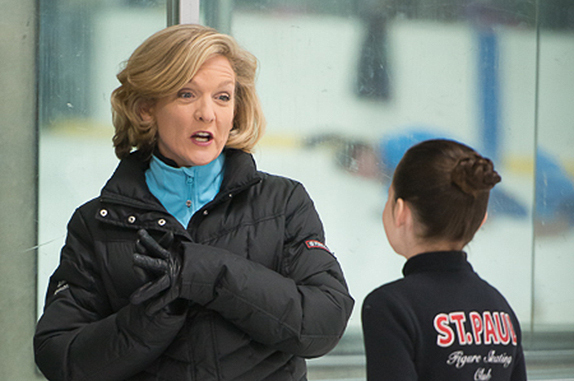 St. Paul FSC is proud to offer a Regional, Sectional, National and International level coaching staff headed up by St. Paul FSC Skating Director Ann Eidson. Visit our Coaches Section to learn more about our staff coaches. Training Camp Package includes the on and off ice classes listed above plus two 30 minute freestyle sessions which can be used for practice or private lessons. Approximately 2.5 hours on ice and 2 hours off ice are included. Ice time and group lessons are included in the Training Camp Package. Additional ice time or private lessons can be purchased at an additional cost as noted in the options listed below. These are sample schedules and are subject to being customized to fit skater's individual needs and private lesson requests. Private lessons are optional but are highly recommended. Class times are subject to change or substitution based on skater's requests or needs. *In Summer, Friday is a half day and may have an early start of 7:00 am depending on schedule. During the School Year Friday is a full day. Additional Freestyle sessions may be purchased. Freestyles that are scheduled will depend on private lesson requests and availability. Freestyle session may start as early as 7:30 a.m. to accommodate private lesson requests. Additional Freestyle sessions may be purchased. Freestyles that are scheduled will depend on private lesson requests and availability. Freestyle session may start as early as 7:30 a.m. to accommodate private lesson requests. Spinner lesson will be scheduled anytime throughout the day based on availability. Freestyle session can be scheduled earlier or later to accommodate desired drop off time. Additional Freestyle sessions may be purchased. Freestyles that are scheduled will depend on private lesson requests and availability. Freestyle session may start as early as 7:30 a.m. to accommodate private lesson requests and drop off time requirements. Spinner lesson will be scheduled anytime throughout the day based on availability. Who is the St. Paul FSC Training Camp Program for? 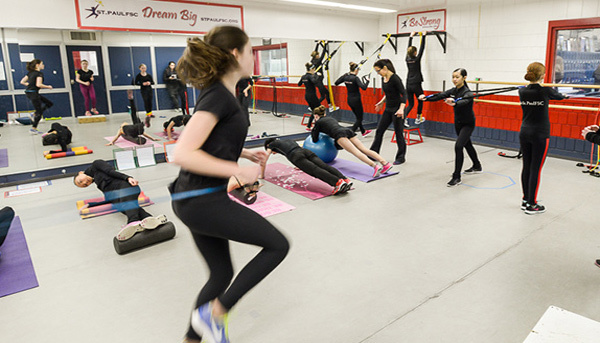 The Training Camp program is for figure skaters of all levels from beginners to elite competitive athletes. All skaters who want to take their training to the next level. We will customize a training program for you. Learn to Skate, Academy, ISI and U.S. Figure Skating Member skaters are welcome. Skate Canada skaters are also welcome. SPFSC member skaters who want to try out classes they have not taken before are welcome to participate. Skaters from all over Minnesota who skate at clubs that don't have ice in the summer. Skaters from any ISI or USFS club are encouraged to attend. Skate Canada skaters are also welcome to attend. Beginning level are also welcome if you want to dive in and try the "figure skating training" experience. Skaters under age 7 it is recommended that a parent stay at the rink with their skater. How is the camp structured? Skaters participating in training camps will train along side St. Paul FSC full time skaters. You will participate in the same classes, skate on the same freestyle sessions, etc. Skaters will come to participate in the St. Paul FSC style of training. 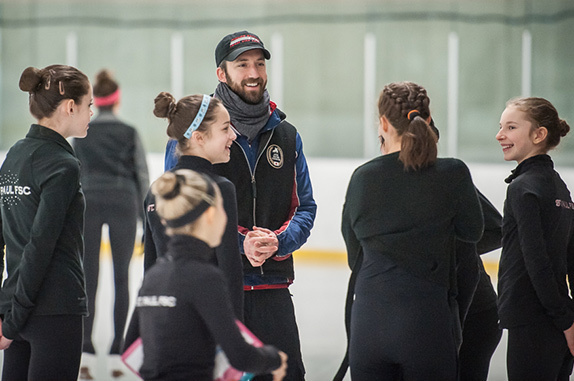 Every skater will receive a personalized training plan while at camp that is based on the skater's level and includes all of the classes that come with the standard camp program and any private lessons or other training options requested. Camp skaters will be assigned a St. Paul FSC buddy who will be another skater who will act as their guide, introduce them to the other skaters, and be their buddy during breaks and relaxation time (adults are always present too). Why choose St. Paul FSC Summer Camp over other camps? St. Paul FSC is the leading figure skating training facility in Minnesota. Led by Skating Director, and International Coach, Ann Eidson, our Regional, Sectional, National and International level coaching staff has developed more USFS Gold Medalists and Regional, Sectional, National and International competitors, medalists and champions than any other club in Minnesota. St. Paul FSC prides itself on offering Excellence at Every Level. Whether you are a beginning level skater or high performance athlete we can construct a program for you. Come for camp and get so much more. 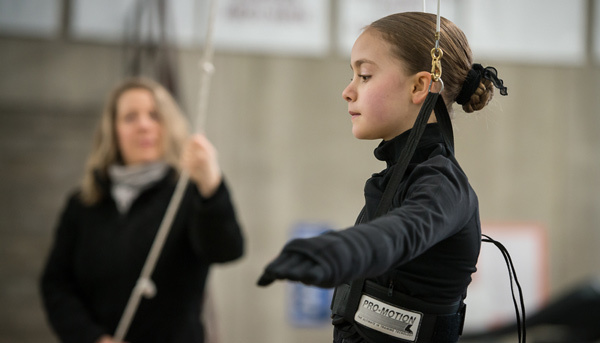 We offer private lessons, program choreography, and pole harness lessons for learning new jumps. The Spinner. We are the only club in Minnesota and one of only three locations in the U.S. to offer the Electric Spinner. The latest off ice technology to teach jumping and spinning technique. The spinner aids skaters in developing body alignment and strength, improved quickness and reactions, and helps them learn how to make corrections quickly on the ice. 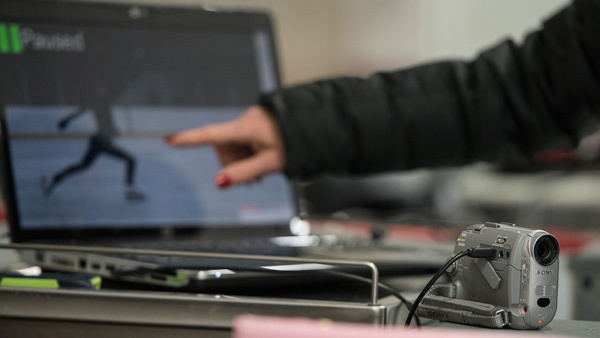 This technology developed by Russian figure skating coaches is largely credited with the rapid increase in the Russians technical development over the past several years. What should I bring to the rink with me for my training day? Are parents allowed to observe? Parents are welcome to observe the training day. Parents may view the off ice classes that are held in the ballet/off ice room through the window as space is limited and only participants are allowed in the ballet/off ice room during classes. All on ice classes or freestyle sessions may be viewed from the bleachers or rinkside tables. Parents are not allowed in the hockey boxes or on the side of the rink with the hockey boxes or in the coach's locker room. Parents are not required to stay at the rink. 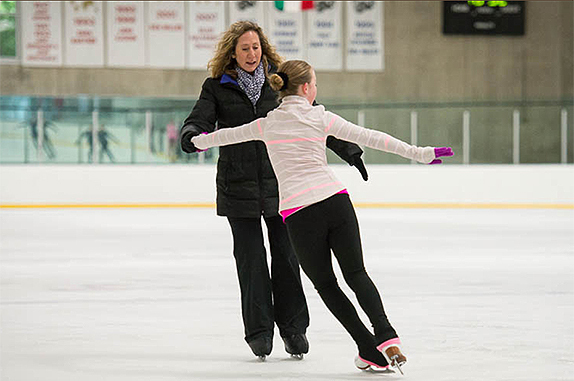 Many parents drop skaters off in the morning and pick up at the end of the training day.